Providing you the best range of space heater with effective & timely delivery. Space (sealed element) is a fine coil of Nickel chrome wire in an insulating binder (MgO, alumina powder), sealed inside a tube made of stainless steel or brass. These can be a straight rods (as in toaster ovens) or curved to fit in a smaller space (such as in electric stoves, ovens, and coffee makers). Space heaters during recent years are widely accepted as a mode of heating due to their flexibility with which these can be formed into any shapes and sizes depending on the applications. Due to their versatility, flexibility and relative insensitivity to mechanical damage, the Space heaters have often provided ideal solution to difficult problems encountered in heating. Our range of tubular heaters are designed and manufactured with state-of-the-art technology which are very compact in construction, easy and economical in operation and consume less electricity. We offer tubular heaters that are practically hassle-free and maintenance free. Our Space heaters are known for their reliability, durability and higher efficiency. 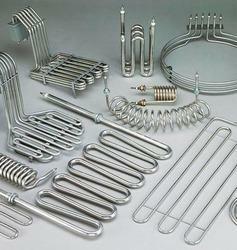 We ensure that our tubular heaters are manufactured for optimum performance. Looking for Space heaters ?